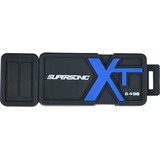 Now you can store and access data without any inconvenience with the Patriot Supersonic Boost Flash Drive. Capable of 3.0 USB speed, it provides you with 5x faster transmission in comparison to 2.0 standard�USB. Its easy plug and play function provides easy compatibility with different version of Windows (�Windows� 8, Windows Vista�, etc.). The drive is backwards compatible with USB 2.0 to support older technology�as well.�Additionally, it's ultra-durable rubberised design ensures optimal protection from daily wear and tear. Buy the Patriot Supersonic Boost Flash Drive�today! Dimensions 2.35" x 0.78" x 0.48"